This is not a recipe per se, more like a collection of ideas on how to roast a turkey. Since I do this at least once a year for Thanksgiving I find myself looking for how-to-tipps from different sources every time. I decided to write down “my own tipps”, the stuff that has worked for me over the years. This way I can always come back and repeat what worked – and not go searching again. I’ll also list a couple of things I like to do with the leftovers – including the carcass – but more on that later. The first thing to consider is: what kind of turkey and how big it should be. – I use a free range turkey that is freshly slaughtered, not frozen, which to my taste has the most flavorful and tender meat. – The size depends on how many people there are to feed, I always make enough to have leftovers for sandwiches and give some to the departing guests. 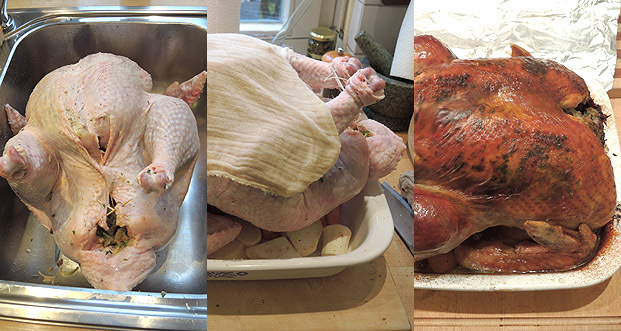 This year a 9 kg (= 20 lb) turkey fed 8 plus lots of leftovers. A bigger bird would not have fit my oven, european ovens aren’t sized for jumbo turkeys. – my friend Kit showed me his trick for a moist and succulent breast. 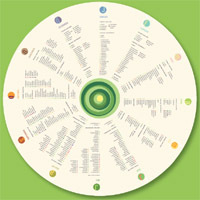 a buch of different fine chopped herbs, mine included sage, rosemary, thyme, parsley… use any you like and have at hand. Mix the herbs with the soft butter, loosen the skin of the turkey breast and smear the butter evenly onto the breast, beeing careful not to tear the skin. This will keep the breast extra moist during the cooking process. all cut into 1 1/2 inch disks. Cover the bottom of your roasting pan with it. This will help cook the bird evenly and provide thickener for your gravy. lay the bird on the “vegetable rack” breast side up. melted together in a small pan. 1 piece of cheese cloth (will be thrown away because it gets burned) steep cheesecloth in the wine mixture and lay it flat on the turkey breast while still quite moist. 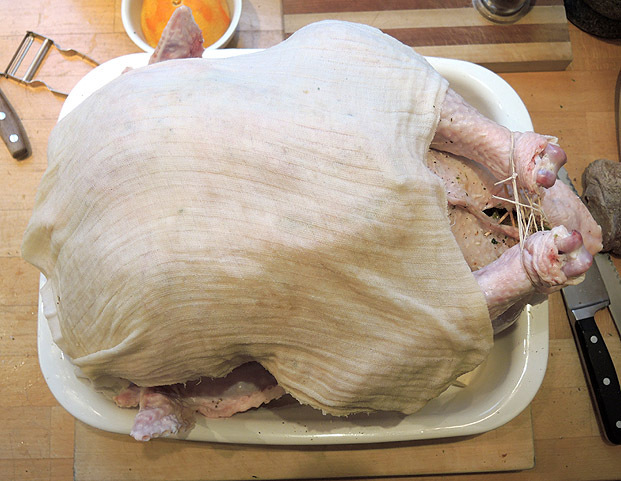 It should cover all of the breast and some of the legs and protects the bird from getting dry. Now the turkey goes in the preheated oven. Set a timer for 30 minutes, at that time baste with the wine mixture, a brush works best for this. Reduce temperature to 350 F (175 C) work quickly when basting so the heat level doesn’t drop too much. – keep basting every 30 minutes until all of the wine mixture is gone. 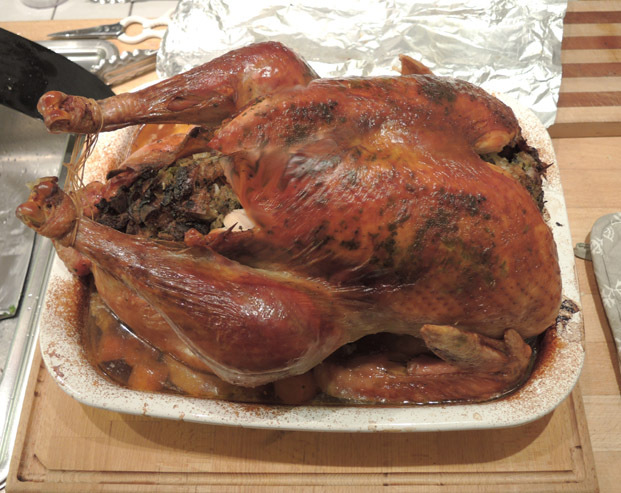 – my stuffed bird (20 lb) cooked 4 1/2 hours and rested covered in tin foil for 40 minutes. – I measured the temperature to make sure the stuffing was cooked, I don’t trust “roast turkey for x minutes per pound” -rules completely so I measure. Dieser Beitrag wurde am 25/11/2013 von Doro Burke in Alle Rezepte, Fleisch / meat, Saisonales / seasonal veröffentlicht. Schlagworte: Herbst, jederzeit gut, Winter.